It's finally autumn around these parts, and we've been enjoying cool but sunny days. Time to put away summer skirts and shorts but I'm in desperate need of some winter smart casual clothes so that on my days off work I can maintain my yummy mummy look (ha! as if). Despite knowing that, I've made a lovely dress that is too smart for the playground but perfect for work or high tea sans grubby toddlers of course. What can I say, I'm more motivated by want than need I guess! Only kidding, just a bit of photoshop mischief! But I didn't want to take anymore width off the sides of the skirt to recreate this at the length I needed just in case it turned out too tight to walk properly, so I took the easy / cheater's way out of just doing a super narrow hem by sewing on some bias tape and turning that under. Problem solved, the hem turned up and sewed down flat nicely due to the stretch in the bias tape. I haven't made a matching grosgrain ribbon belt, but I think I will because it is a pretty look. The fabric I used is from the stash (yay! ), again an opshop buy I think because something else had been cut out from it. I think it is wool or has a high wool content because it gets that wet dog smell when wet and presses really well, but it's very soft like a flannel or brushed wool. It's a dark grey / black herringbone pattern and is just right for this dress. Although it has no stretch, so I'm going to have to take dainty steps instead of striding out purposely in the normal manner I get about in, due to the narrow width at the bottom of the skirt. I also made a full lining by cutting out the pattern pieces in a grey bemsilk and making the pleats at the waist because I was too lazy to figure out and redraw the pattern piece without the pleats. But it doesn't add too much volume there at the waist so once again the easy way out wins the day. Thanks for your lovely comments for Anna's shirt. Thankfully the ear infection cleared up very quickly due to the antibiotics she had to take, but I'll make sure I try your olive oil tip JBranley next time first in preference to dosing her up with antibiotics. Pixie your comment had me laughing out loud! And Verobirdie, yes a 6 hour meeting is crazy and probably not useful at all but since we had staff fly in from our regional offices we crammed as much into the day as we could. I'm sure they were as glad as I was to get out there! Well it's a very short working week for me this week with today (Monday) being a public holiday and Wednesday I'll be out in one of our regional offices about three hours away to deliver some training. Happily I should get some op shopping in too! But I did manage to finish up another shirt for her last week. I had an image burned in my brain of a little girl's floral blouse with red buttons, possibly from one of those cute Japanese sewing magazines that I browse but never buy (they look more bewildering than BWOF). I just had to sew it up before I lost the idea. Using the vintage Butterick 422 that I used for the purple gingham shirt, I managed to eke out a blouse from a remnant size piece of lovely light coloured floral cotton I had in the stash picked up in an opshop. I changed the collar from the oversized pointy one to a peter pan rounded collar by cutting out a collar piece from another pattern because just rounding off the ends doesn't quite work out! 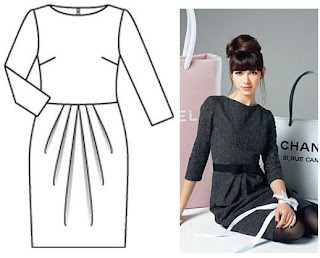 A peter pan collar is shaped a bit like a jelly bean, and is very differently shaped to a normal collar. I left off the pocket because I didn't have enough fabric left, in fact I had to cut the facings out of a different fabric altogether (some lilac poplin) due to a shortage of fabric, but it actually looks quite cute. So here is a photo of the blouse laid out flat, the best I could do peeps! Even thought this pattern was the same I used for the purple gingham shirt, the floral shirt looks much larger on her, but I guess she can grow into it. Something new, not a UFO for a change! Well I finally finished the Burda dress that has been absolutely annoying me for the last two weeks. Thanks to my new resolve of no new UFOs, I overcame the crappy instructions (no surprises there), and the most slithery, shiftiest and difficult to pin down fabric ever. It's a pretty simple shape really, but what I couldn't figure out is how there could be five pleats shown on the line drawing, when there are only three drawn on the pattern piece. 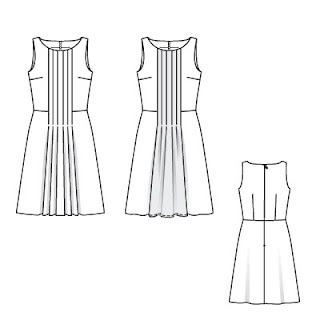 Thank god for Pattern Review, because others had figured it out for me: the seam line joining the side pieces with the central pleated panel gets folded under and pressed into another pleat. So with that sorted out I could finally finish sewing it. The fabric I picked is a grey wool flannel from the stash picked up from either an op shop or a garage sale sometime in the past. Yeah I know, it's plain grey and looks just like the magazine photo but what can I say? Anyway the fabric had a lovely drape and a good dress weight, but it would wrinkle like crazy if I just looked at it, so I decided to underline the whole thing in organza. But the fabric would shift and move badly during sewing even though I used a gajillion pins so it became quite difficult to sew. Um, the dress is straight, I'm just standing like a drunken sailor! Sure there's some wrinkling going on back there, but not as much as I expected after sitting down for the most of the day at work. I also lined the entire dress in a Bemberg lining because I thought the organza layer might get scratchy. Shame on Burda for designing a dress that isn't a simple summer floaty thing without a lining, but it's not too hard to use the side pattern pieces, adding a bit extra for the front centre panel and cutting it on the fold so as to cut down bulk. I did the lining right to the edge of the dress because with all those pleats at the neckline there was already enough bulk. 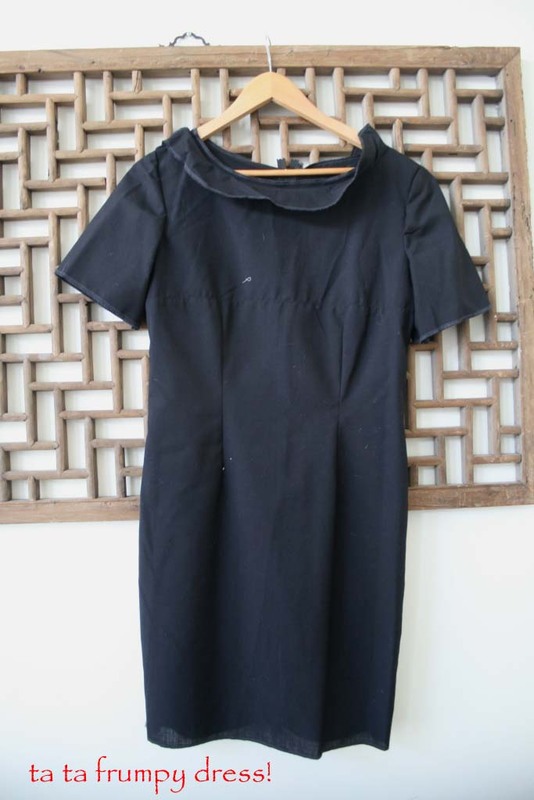 Technically this dress turned out really well - I put in a perfect invisible zip, lined up the waist seamlines exactly and by putting in little darts at the shoulders it fits closely around my forward sloping shoulders. But I think this dress is a little.....blah, to be honest. I think it's a combination of the plain light grey and I think it looks a little like a school uniform. I wore it to work today with a black cardigan and the shoes in the above photos, but perhaps I need to do some dress up to see how I can better style it. But for now I'm just pleased to get it off the sewing machine and into the wardrobe. 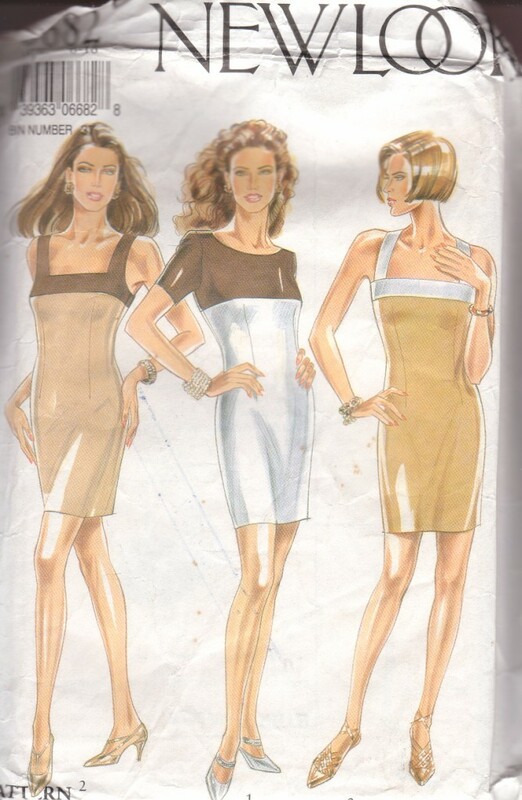 I think I'm a glutton for punishment though, because I already have another Burda dress traced off and about to cut! Too bad for us here in Australia he's in New York because we too are being plagued by this horrendous epidemic. So you can imagine my shame when I saw my daughter doing the same thing when I picked her up from day care last week! Since she's such a beanpole, her store bought pants are all too short now but still way too big around her waist, especially in the disposable nappies she has to wear to the child care centre. So I decided to take a little time out from sewing my pain in the a$$ BWOF dress that I've been working on to whip up some little pants for her, using an OOP Kwik Sew 2216 pattern. 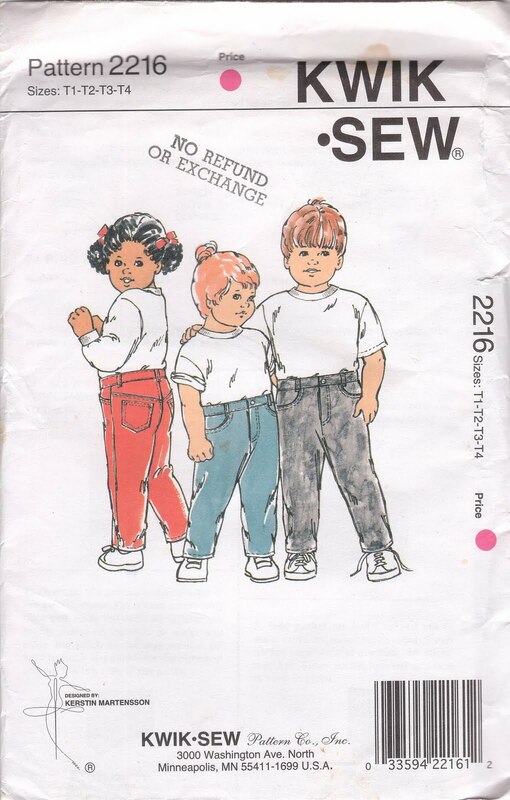 My past experiences with sewing patterns for little kids has so far been a bit hit and miss, as some of them tend to be way too big, but the Kwik Sew pattern was a good fit using the T1 size for the waist and the T4 size for length. Although I did still add elastic across the back of the pants to make sure the fit was nice and snug. I made two pairs in cotton drill, one in a caramel brown colour and the other in black because you're certainly never too young to have some wardrobe neutrals to mix and match with all the pink in one's wardrobe! Anna has put them through their paces, and if she could I think she'd give them a big thumbs up (although shaking her head 'no' to everything is her favourite move at the moment). And check out Anna striking a pose for you, this is almost worthy of a Kmart catalogue! I also made her that purple gingham shirt, from vintage Butterick 422 which is a boy's pattern but really a shirt is a shirt and in purple it's girly enough. I made no changes to the pattern other than sewing the pocket on the bias and using my trusty plastic press snaps instead of fiddly buttons down the front because she doesn't sit still for very long these days and trying to do up buttons would drive me nuts. Happily, all of these were made from stash fabrics, and now I can send my daughter off to school safe in the knowledge that she's not flashing her nappy around as though she is a yuppie reliving the 90s trend for showing off a pair of Calvin Klein briefs! Anna - I answered on your blog, but I'll repeat it here. I don't trace my patterns, even my vintage ones (shock! horror!) because generally I use the pattern only once or twice, I only do a small amount of pattern adjustments, and if it's a multi sized pattern I just fold along the size I want, tucking the excess under and ironing it flat (sometimes clipping the curves to do it). But I have read on other people's blogs who are more diligent or do more pattern adjustments use cheap interfacing to trace onto. Anyone else got any tips? 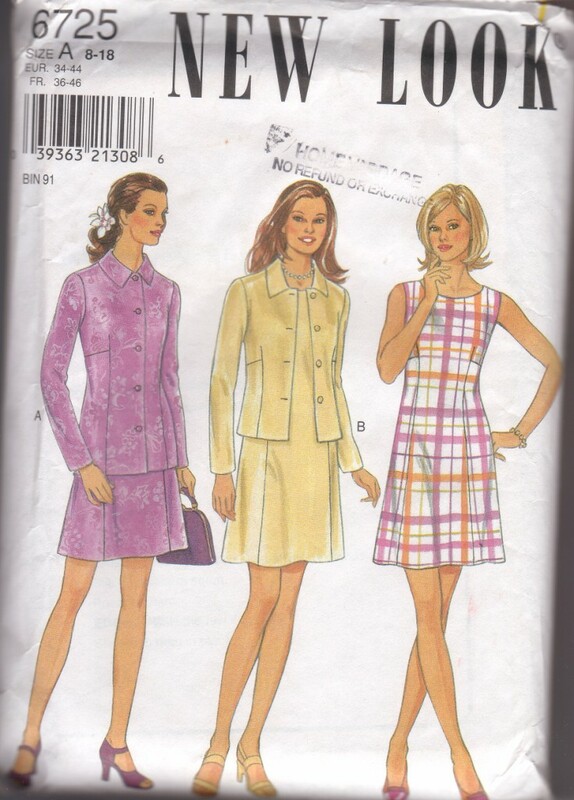 Carol - I don't have the scanned patterns saved in any searchable database, just sorted in different folders depending on what they are (dresses, suits, kids, skirts, etc). But a searchable database sounds like a good idea, and an even better idea for my fabric had I photographed and measured each piece. Katherine - I wondered how you could bear to sell any of your patterns, but now you admit to having 5000 I can see how! Livebird - you lucky girl having a $5 sale and thank you for your kind offer, but I must. stop. buying patterns when I have so many projects already lined up. marLou and Reethi - same for you both, stop tempting me people! Neighbourhood gal - I'm using B2 sized envelopes, they fit an A4 sheet of paper folded in half once. But just for you I tested it out with the A4 sized envelopes, and you would get two rows of them laying on their long side, with a bit of space left over for some smaller envelopes. 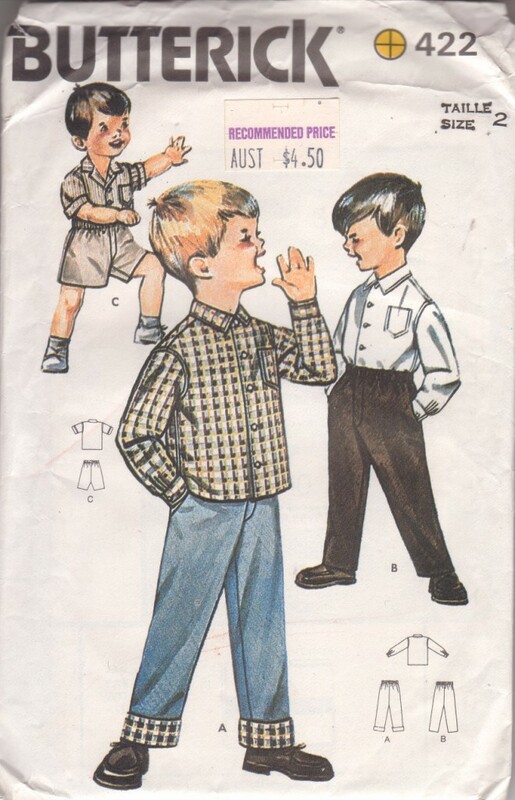 Jean - I have my patterns spaced out now since they're ordered by pattern company, but until recently I did have them all crammed in the one chest of drawers, so I'd say you could fit around 700 or so of the standard patterns (not the big Vogue ones though) in the one cabinet. And I'm working on the appearance of them, stay tuned for a sewing room reveal. 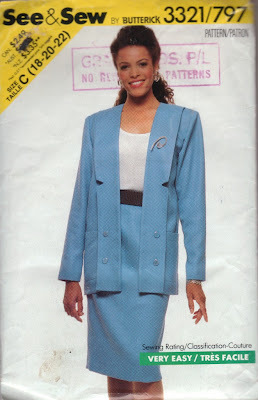 please, someone out there, confess if you made this or a similar pattern in the decade that style forgot! Isn't it gorgeous? I only bought it because they were having a $15 Vogue pattern sale - patterns are certainly much much dearer here in Australia than they are in the US. If we had 99c pattern sales here I think I would firstly faint from over excitement, and then have a bigger problem storing my patterns than I already do! Anyway, since patterns are so expensive, although most of mine are vintage patterns collected from various sources, I hold on to them and never get rid of any, even really ridiculously ugly ones. I like to think of them as a fashion history sourcebook. At last count I have about 700 (gulp!) ranging from the 1940s onwards, although I seem to have the most from the 60s and 70s. Which of course poses a big problem of where to put them and how to find them. and are the right width for smaller pattern envelopes like my Simplicity patterns to fit five rows across. Each pattern is stored in numerical order, according to the pattern company. I also have scanned the envelope front of each one and have it saved to a USB key, so I can quite easily browse through the patterns without having to physically flick through each one. Plus I can look at them anywhere since it's on a USB key, and I quite often spend a lunch hour at work daydreaming of which patterns I'd like to make. For BWOF patterns I scan the magazine pages that have all the styles on the one page (both line drawings and photos), and for the patterns that I have traced, I print out a picture of the technical drawing downloaded from the Burda site, glue it onto an envelope front and they also go into a pattern drawer too. Too easy! So my pattern drawers, combined with my giant wall of fabric really makes me feel like I have my own little fabric shop happening! I've called it quits on the UFO jacket that I butchered last week, it was just not salvagable at all due to some hasty and careless cutting on my part. 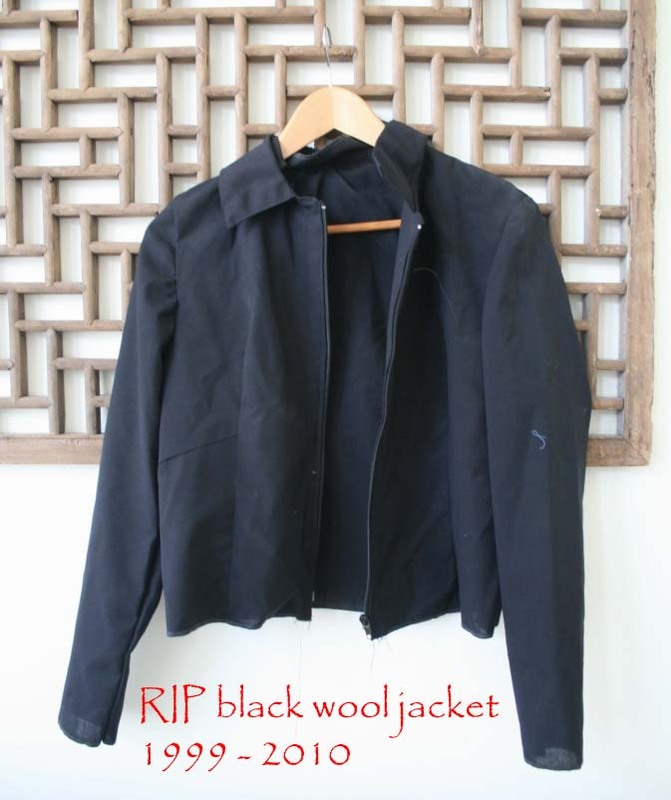 I started this jacket in about 1999 I think, along with a dress and a pair of pants in some lovely black lightweight wool suiting bought from Fine Wools Direct when they used to be in St Peters (as some of you Sydneysiders may remember). They were duds from the start, and in fact the only reason I held onto them for so long is because the fabric was lovely and it would be a shameful waste to chuck them. The jacket I made from New Look 6725, which is not only OOP but the number has already been reissued. It is a short button front jacket that I chose to use a zipper closure instead. The problem being the only open ended zips I have seen available retail are chunky plastic ones, which was way to heavy for this jacket and it hung badly. So it sat as a shell while I searched for a better zipper, which I never have found. So a few weeks ago I took the zipper out, put a bit more interfacing in it and made a lining for it. 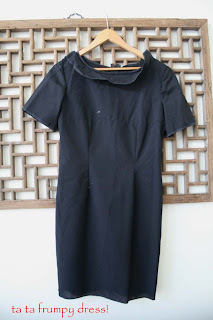 It fitted really well, except that the shoulder were a bit too wide, since I have narrow shoulders and generally take at least 2 cm out of the shoulder seam width. Well, whilst I was wearing the jacket I marked where I wanted the shoulder seam to finish, unpicked the sleeves and then (and here's the stupid bit) cut the jacket along the marked line, not allowing for a seam allowance! So when I sewed the sleeve back on, of course the shoulders are too small now and I can barely move my arms and it just looks stupid. And that was the end of the jacket. But I do like this style, so I may one day make another. 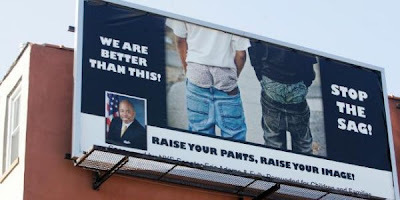 The pants aren't even worth mentioning, except to say they fitted very very badly. The dress I made from New Look 6882, another OOP pattern that has also been reissued. My mum actually sewed the halter neck version on the right in a floor length version for my year 10 formal school dance, when I was all of 16! I made the short sleeved version in the middle, and it was so dowdy on me: too short, too tight through the hips, too loose through the bust and that seam line that runs across the bust line in real life just looks wrong. And you can see the back view, which should be cut on the fold and have a side zipper but I have put a centre back seam instead. I also mitred the hem, which I had to look up and found a great tutorial on the Threads website since I'm not a quilter and always forget how to do that. So this skirt may be the one that breaks me out of my matchy matchy ways, maybe a nice cardigan with a belt for smart casual at work. Happy easter everyone, remember calories from easter egge don't count on easter Sunday (but you have to take responsibility for any eaten before or after! ).